Melanoma is the most severe form of skin cancer. It can even be fatal, although timely detection and treatment can effectively protect against this eventuality. This treatment may come in the form of surgical incision, or as medical anti-tumour therapy. Medical treatment for melanoma has resulted in full remission for some patients. However, adaptations in these tumours have led to relapses for others. This is true for a recently-developed treatment called anti-PD-1 therapy. Anti-PD-1 treatment strategies inhibit a receptor expressed by melanoma cells that induce death in anti-cancer white blood cells. However, if these cancer cells also express an immune-system protein called TNF-alpha, (or TNFα) this drug action can be invalidated and the tumour is allowed to progress in the absence of alternative treatment. Therefore, a team of researchers set out to investigate the potential of TNF inhibition in the restoration of anti-tumour immune responses in samples of human melanoma. They found that this TNFα blockade expressed the necessary receptors and other proteins necessary for these immune system functions. The immune modulator protein TNFα has a complicated relationship with cancer development and treatment. It may be associated with anti-tumour effects in some forms of the condition, and pro-disease activity in some others. 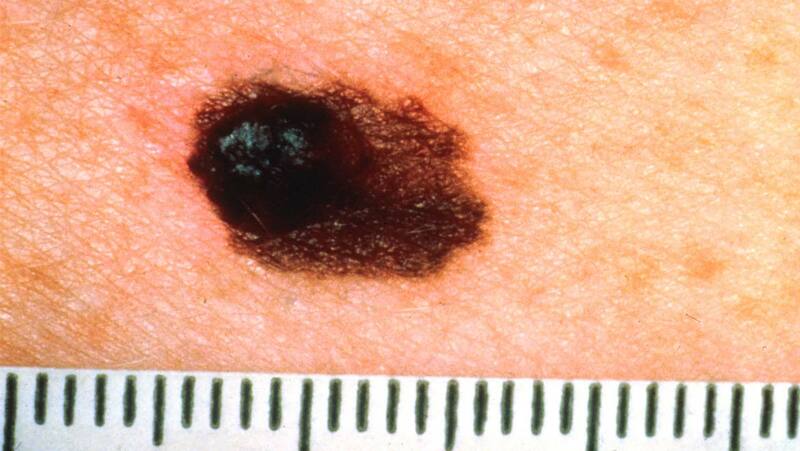 Melanoma is an example of a cancer in which TNFα may promote progression. The protein may signal anti-cancer lymphocytes, also known as CD8+ T-cells, to die rather than infiltrate a tumour and help destroy it. This can be done by stimulating another class of lymphocytes (CD4+ T-cells) to release TNFα, or by using the protein to up-regulate the production of the ligand for a receptor for programmed cell death (known as PD-1) which results in death for CD8+ cells. This is the basis for anti-PD-1 therapies, which come in the form of antibodies to the receptor. These can combat the tumour’s function and progression. Unfortunately, this can lead to side-effects due to other immunogenic TNFα functions. However, the additional administration of anti-TNFα antibodies can address these adverse effects. However, anti-PD-1 antibody therapy has exhibited a lack of effect in up to 67 percent of patients, leading to treatment failure in some cases. PD-1 inhibition is just one in a series of immune ‘checkpoints’ through which T lymphocytes have to pass in order to carry out their functions. Therefore, if one fails, tumours can hijack yet another to prevent infiltration by CD8+ cells. Studies have shown that human melanoma cells can use checkpoints such as those that involve T-cell immunoglobulin- and mucin-domain-containing protein 3 (TIM-3). In addition, such cells may also increase the expression of TNFα in response to PD-1 inhibition. A team of scientists, working in cancer laboratories and institutes in Toulouse, designed a project to validate some of these observations and to investigate the potential of TNFα blockade in restoring efficacy to anti-PD-1 antibodies. They injected mice engineered to express low levels of TNFα (or its receptor, TNFR1) and corresponding wild-type mice with an experimental line of melanoma cells. The team found that the growth of the resulting tumours was significantly impaired in low-TNF mice that were also injected with anti-PD-1 antibodies, compared to those who were left untreated. Wild-type mice with melanoma who were also in “anti-PD-1” treatment groups also exhibited significantly delayed tumour growth, although the majority also experienced relapse and death after about 60 days into the study. These results held true for mice with tumours of up to 25mm3 in size. Therefore, it can be said that a combination of TNF depression and anti-PD-1 therapy is likely to impair the growth of melanoma tumours. The team also reported that treating low-TNFR1 mice with anti-PD-1 antibodies also inhibited tumour growth in these animals, and also enhanced their survival. The researchers also injected a second round of melanoma cells into these mice, and reported that this intervention did not affect survival (for about 120 days) in this group. The group then expanded their study to include groups of wild-type, low-TNF and low-TNFR1 animals injected with a line of lung carcinoma cells. This resulted in no difference in tumour growth rates between these groups in response to anti-PD-1 therapy. However, the team did report that anti-PD-1 therapy resulted in small but significant increases in the populations of CD45+, CD8+ and CD4+ T-cells in the melanoma tumours of wild-type mice. CD8+ populations in the tumours of low-TNF mice were reported to increase “dramatically”, even without anti-PD-1 therapy. Therefore, anti-PD-1 antibodies, in conjunction with TNF inhibition, may enhance the infiltration of these T-cell types into melanoma-related tumours. The researchers also reported that anti-PD-1 therapy did not affect the proliferation of T-cells in either wild-type or low-TNF mice. On the other hand, the treatment did result in significantly less T-cell death in low-TNF animals. Therefore, it could be said that both PD-1 and TNF inhibition may conserve (but not enhance) T-cell populations within melanoma tumours. The researchers also found that PD-ligand 1 (PD-L1) up-regulation (which was a typical response seen in the tumours of wild-type mice injected with anti-PD-1 antibodies) was completely negated in the tumours of low-TNF mice. In addition, dendritic cell (which also invade tumours in order to kick-start T-cell responses) populations were also significantly boosted (albeit to a minimal degree) in both wild-type and low-TNF mice treated with anti-PD-1 antibodies. Treated and untreated low-TNF mice also exhibited dendritic cells that expressed significantly less PD-L1 and PD-L2. The researchers also reported findings from in vitro studies that indicated a role for TNF in the expression of TIM-3 on CD8+ cells. This may represent a “backup plan” for melanoma cells in the event that T-cells ‘pass’ the PD-1 immune checkpoint. It was found to be associated with the actions of the intercellular signalling molecule p38 MAPK, which is the critical step in TIM-3 up-regulation via activation through MEK and PI3K, which are activated by TNF. Therefore, this team of researchers may have established a potential role for the combination of anti-TNF and anti-PD-1 antibodies in the treatment of melanoma. They have demonstrated that such an intervention may help tumour-invading T-cells to pass at least one ‘immune checkpoint’ that cancer cells appropriate in order to survive. Assuming that this new form of therapy withstands future validation and clinical evaluation, it may be an asset to the medical treatment of melanoma. Bertrand F, Montfort A, Marcheteau E, Imbert C, Gilhodes J, Filleron T, et al. TNFα blockade overcomes resistance to anti-PD-1 in experimental melanoma. Nature Communications. 2017;8(1):2256. Bertrand F, Colacios C, Segui B. TNF-R1, an immune checkpoint in melanoma? Genes & cancer. 2015;6(9-10):369-70. Koyama S, Akbay EA, Li YY, Herter-Sprie GS, Buczkowski KA, Richards WG, et al. Adaptive resistance to therapeutic PD-1 blockade is associated with upregulation of alternative immune checkpoints. Nat Commun. 2016;7:10501.